The Office of Congressional Accessibility Services (OCAS) provides a variety of services for individuals with disabilities. Services include, but are not limited to, adaptive tours, sign language interpreting services and wheelchair loans. OCAS can assist with questions regarding accessibility issues in the Capitol, the House of Representatives and the Senate. 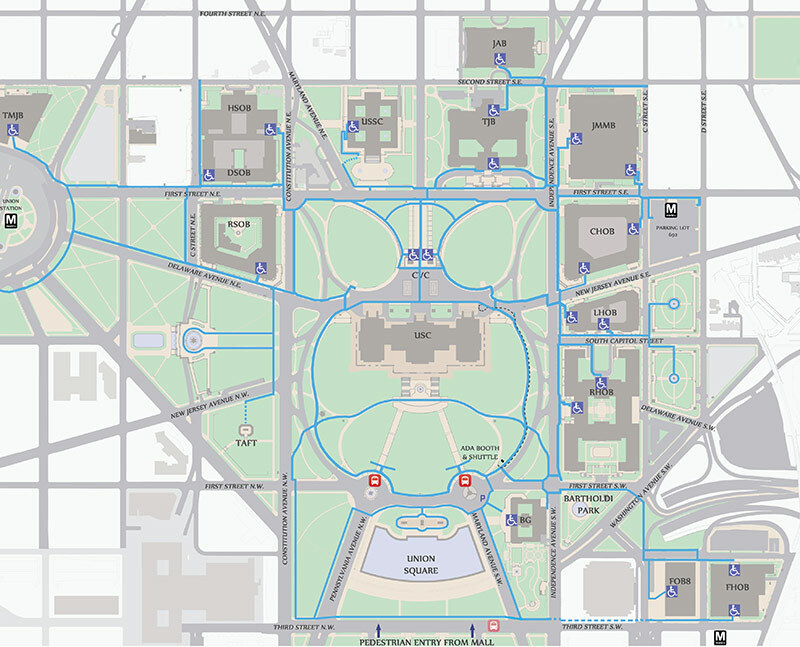 The Architect of the Capitol works to provide an accessible pathway for the Capitol campus. Click to enlarge the map below. Public tours enter through the Capitol Visitor Center; Official House business enters on the south side of the Capitol; Official Senate business enters on the north side of the Capitol. Main entrance at First and East Capitol streets. The CVC also offers an on-demand shuttle and other services. Entrance on C Street, SE, west of the First Street intersection. Entrance will be operational January 2, 2017. This replaces the previous entrance on New Jersey Avenue, SE, south of the terrace at the intersection with Independence Avenue. First and C Street entrance. Entrance on 3rd Street, SW. Or 2nd Street, SW.
Second Street entrance or Constitution Avenue entrance. Main entrance, Independence and New Jersey Avenues. Or the South Capitol Street entrance. C Street SW between 2nd and 3rd Streets. Horseshoe drive off South Capitol Street or entrance on Independence Avenue. Delaware entrance on ground level closest to Constitution Avenue. Public parking is very limited around Capitol Hill. The closest public parking facility is Union Station. The District of Columbia does recognize accessible parking permits issued by the states and territories. Parking is permitted at designated handicapped spaces or any metered/un-metered parking space (no fee required), within the hours allowed for general parking in that area. Visitors must display state-issued handicapped tags or permits. Parking is not allowed where stopping, standing or parking is prohibited to all vehicles, in spaces reserved for special vehicles (buses, taxis, etc. ), or where it would clearly be a traffic hazard. Visitors who have an appointment in a Senator or Representative's office may request accessible parking through that office. Assistive Listening Devices can be provided to House and Senate Offices for such things as meetings with constituents, a staff-led tour, or constituent coffees. OCAS has a portable ALD for use by House and Senate Offices in these instances. House and Senate Committee Hearing Rooms are equipped with ALDs. The House and Senate Galleries are equipped with induction loops. Gallery visitors wearing hearing aids with a "T" frequency switch can access this ALD system. Each of the accessible galleries also have a closed circuit TV, with real-time captioning. Contact OCAS if you have questions. OCAS has an audio descriptive tour CD that is designed to acclimate visitors who are blind to the Capitol and its surroundings. This CD is not meant as a self-guided tour, but it is to be enjoyed prior to or after a tour of the Capitol. Copies of this CD are available for House and Senate Offices to provide to their constituents who are blind or have low vision. This tour allows visitors who are blind or have low vision to enjoy the exhibits displayed in the Exhibition Hall area of the Capitol Visitor Center (CVC) through a self-guided narrated tour. As exhibit documents are changed in the display cases, the tour is updated accordingly. This audio-descriptive tour is available on a handheld device which may be requested at the North Information Desk in Emancipation Hall. Visitors can also download the tour to their personal device from the Capitol Visitor Center website. OCAS can assist House and Senate Offices in communicating with their constituents via documents in alternative formats. Examples include letters in braille, large print, or HTML for use with computer software that reads text aloud. The Office of Congressional Accessibility Services (OCAS) has certified sign language interpreters on staff that are available to interpret for official Congressional business. This can include staff meetings, visits with constituents, press conferences, and work-related instructional classes (such as computer training). Requests for sign language interpreting services are made through a Senator or Representative's office. All public tours of the Capitol are accessible. Individuals with disabilities may also take a tour tailored to their individual needs, provided by the OCAS. Tours last approximately one hour. Walk-up tours are accommodated as staff availability permits. Tours can be arranged in advance by contacting OCAS directly or through a Senator's or Representative's office. Wheelchairs are available for use by visitors in the Capitol Complex. Individuals entering through the Capitol Visitor Center may make a wheelchair request at the coat check areas, with any staff wearing a red vest or at one of the Information Desks in Emancipation Hall. Constituents visiting for other purposes may request the use of a wheelchair through their Senator's or Representative's office.